SMG are delighted to have brokered the extension of the agreement between Tappit and BURY FC for a further three years. The new deal will see tappit become the club's sole shirt sponsor, featuring on both the new home and away shirts, which will be unveiled this summer. It will also see the Cemetery End stand renamed ‘the tappit stand’ from the beginning of the 2018/19 campaign. 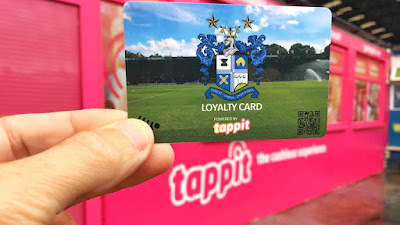 Tappit, which is owned by Thai company Sappaya, provides cashless experiences at sports events, festivals and other entertainment venues across the globe, and has been implementing a cashless system at the Energy Check Stadium at Gigg Lane since last October. And from next season, the club's season tickets will be added to a tappit cashless payment card, which will replace the existing season ticket booklets. It is intended that the all-encompassing card will enable quick and secure entry into the ground, while pre-loaded funds will enable faster transactions for cardholders in the club shop and food and drink outlets. Matt Hanson, business development director at Bury FC, said: “tappit is much more than a shirt sponsor for us and we’re thrilled to have their support for a further three seasons. "As well as shirt and stand sponsorship, tappit has been fully supportive of a number of our partner charities and is also sponsoring our Under 23s next season, helping us build a pathway to the first team for our young players. "Season tickets will now grant access to holders via tappit’s cashless card, which also enables them to spend around the stadium. Jason Thomas, CEO of tappit, added: “We’re fully behind Bury in their push for promotion next season and proud to continue our journey in making the Energy Check Stadium at Gigg Lane a fully cashless stadium.